Kigali, 12 September 2017 – The Next Einstein Forum (NEF) today announces its second Fellows Class, 16 scientists, all under 42 years of age, who are solving Africa’s and the world’s challenges. An initiative of the African Institute for Mathematical Sciences (AIMS) in partnership with the Robert Bosch Stiftung, the NEF will hold its second global forum for science in Kigali, Rwanda, under the patronage of H.E. President Paul Kagame. Central to the NEF’s vision of propelling Africa onto the global scientific stage, the NEF Fellows will present their groundbreaking research at the NEF Global Gathering 2018, to be held on 26-28 March 2018, and help craft an exciting, high impact forum. “Two years ago it was my great honor to announce the inaugural Fellows Class. Today again, I am excited to announce a brilliant NEF Fellows Class. The selected Fellows, six of whom are women, are doing cutting edge research in renewable energy, nanomaterials and nanotechnology, food security, regenerative medicine, cognitive systems related to fintech, cosmology, seismology etc. Beyond just theoretical research, our Fellows have developed impressive technologies from their research. We strongly believe their discoveries and initiatives, current and future, will solve global challenges in health, energy, climate change, education, agriculture to name a few,” said Mr. Thierry Zomahoun, President and CEO of AIMS and Chairman of the NEF. NEF Fellows are selected by a prestigious Scientific Programme Committee using a rigorous process that looks at academic and scientific qualifications including a strong publication record, patents, awards, and independently raised funds for research. Fellows also have to demonstrate the relevance and impact of their research/innovations to society as well as a passion for raising Africa’s scientific profile and inspiring the next generation of scientific leaders. “I would like to thank the first Fellows Class who have used their tenure to publish high impact research, multiply collaborations among young researchers globally and mentor the next generation. Their active participation in crafting the program has improved the Fellows Programme. 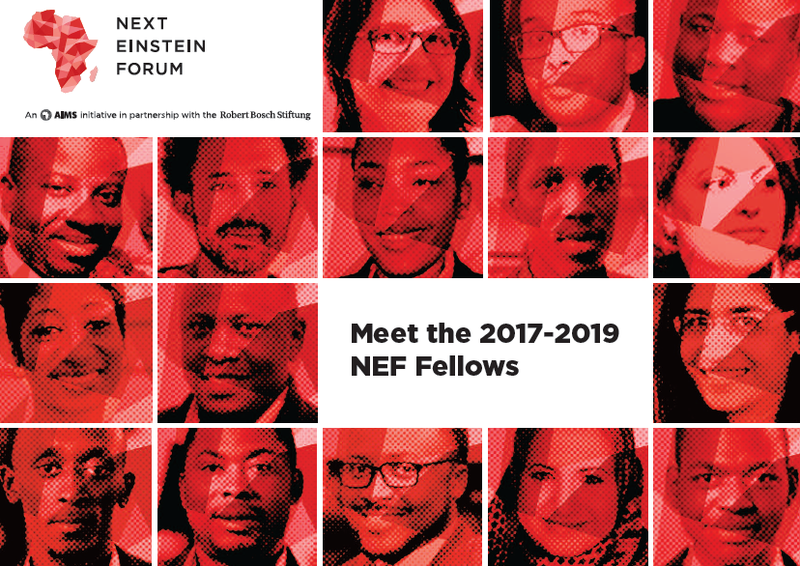 Together with this new Fellows’ class, they join the newly launched NEF Community of Scientists, an exclusive network that offers members opportunities for consulting, grants, research collaborations, speaking opportunities and career mentorship. In return, members will participate in national and continental policy formulation, cross-cutting research and innovation activities, lead public engagement around science and technology in Africa, and provide mentorship to early-career scientists and students,” said Mr. Zomahoun. Vinet Coetzee (South Africa) is working on affordable and non-invasive methods to screen children for nutrient deficiencies and inborn conditions, by training computer models to recognise the links between physical features and these conditions. For instance, Vinet’s team developed an affordable 3D camera at one tenth of the price of comparable commercial systems. Abdigani Diriye (Somalia) is developing, together with his team at IBM Research Africa, new approaches to mine, model and score people, identifying the right amount of credit and appropriate products. Last year, they developed a machine learning approach that leverages new data sources (mobile phone behavior) to evaluate the financial profile and credit score of millions of people in East Africa. Kevin Dzobo (Zimbabwe) is leading an inter-university collaboration between ICGEB/University of Cape and the University of Pretoria on developing a ‘stem cell-ECM’ bandage or patch which when fully developed can be used on injured tissue. Jonathan Esole (DRC) introduced, while at Harvard University, a new topological invariant known as the orientifold Euler characteristic, which is now used daily by physicists working in F-theory. Jonathan also solved problems in supergravity open for more than twenty years. Yabebal Fantaye (Ethiopia) investigates the statistical properties of the Universe using the Cosmic Microwave Background (CMB) data from the Planck satellite. More practically, his research focuses on developing machine learning and other advanced statistical methods for harnessing the African GIS and social Big Data for extracting actionable insights to help Africa meet the UN Sustainable Development Goals. Aminata Garba (Niger) is interested in finding key policies, technologies and applications relevant to the development of ICT, particularly in rural and underserved areas. As well, she is interested in methods that allow increasing the data rate of communication systems by shaping and reducing the interference. Mamadou Kaba’s (Guinea) research projects led to better understanding of the risks of transmission of hepatitis E virus (HEV) from animals to humans. He is currently conducting a prospective longitudinal study on how the composition of the respiratory tract and gastrointestinal microbial communities (microbiota) influences the development of respiratory diseases in African children. Rym Kefi (Tunisia) is mainly involved in research on human genetic disorders, genetic diversity in North Africa and the impact of consanguinity on health. As well, she is strengthening research on ancient DNA and providing genetic profiling for paternity tests and human forensic identification at Institut Pasteur de Tunis. Aku Kwamie’s (Ghana) research is in the area of health system governance, looking at how and where within health systems decisions get made, applying complexity theory to issues of management and leadership, accountability and organizational innovation. Justus Masa (Uganda) leads several research projects in the field of electrocatalysis and energy conversion, focused on the development of advanced low-cost catalysts and electrode materials for electrochemical energy systems, including fuel cells, electrolyzers (power to gas energy conversion), rechargeable metal-air batteries and other modern battery systems. Sanushka Naidoo (South Africa) is dedicated to plant defense in the forest species, with an emphasis on Eucalyptus. Her research is focusing on mechanisms that can confer broad-spectrum, long lasting resistance by dissecting gene families and responses to pests and pathogens. Maha Nasr (Egypt) focuses on advanced technologies such as nanotechnology based drug carriers and composite delivery systems. She is currently investigating the possibility of creation of novel carriers for treatment of diseases, mainly cancer and Alzheimer’s. Sidy Ndao’s (Senegal) research group has recently developed the world’s first high temperature thermal rectifier, a building block for future High Temperature Thermal Memory and Logic Devices, i.e., thermal computer. He is also the founder of the Pan-African Robotics Competition. Peter Ngene (Nigeria) developed a strategy which is now widely used to make complex hydride nanocomposite materials for reversible hydrogen storage applications and solid-state electrolytes for rechargeable batteries. He has also developed inexpensive eye-readable hydrogen sensors for the diagnosis of lactose intolerance via hydrogen breath test. Tolulope Olugboji (Nigeria) builds sophisticated computer models and designs novel remote sub-surface imaging techniques to improve the understanding of the architecture and composition of the solid Earth interior. Hamidou Tembine’s (Mali) research investigates game theory and aims to contribute significantly to existing knowledge on the interactive decision-making problems with incomplete information, and in the presence of self-regarding, other-regarding, altruistic, spiteful, risk-sensitive, and irrational agents. These brains the Lord should uphold. Excited about our own Africans leading the innovations. The Next Einstein Forum will be in Nairobi, 2020.